As you can probably see by the length of this blog post, my second day in Madrid was VERY busy. Since it was my first full day in the city and only 1 of 2 that I would have, I didn’t want to waste a single second. While I ended the day with extremely sore feet, it was such a rewarding day and the beginning of my love for Madrid. Hanso is located in the trendy Malatesta neighborhood and thus a little further away from the typical touristy Madrid hot spots, but walking through the neighborhood to reach the cafe I simply loved how peaceful everything was and how the streets were so empty and cute! There are tiny fashionable shops lining the streets and many other adorable cafes. I was really looking forward to eating at this Spanish Korean cafe, but sadly their famed matcha and okinomiaki waffles were both unavailable (apparently they only start serving waffles at 2pm on weekends). Instead, I ate an avocado toast with scrambled eggs and tun topped with my favorite kewpie mayo. My delicious red velvet latte was beyond my expectations, although it wasn’t too strong. Originally I was planning to rent a bike and ride around the Park, but when I got to the bike rental shop, Rent and Roll, it wasn’t open yet (I guess Spanish shops aren’t too prompt on the weekends…) so instead I just took my time wandering through the Park. 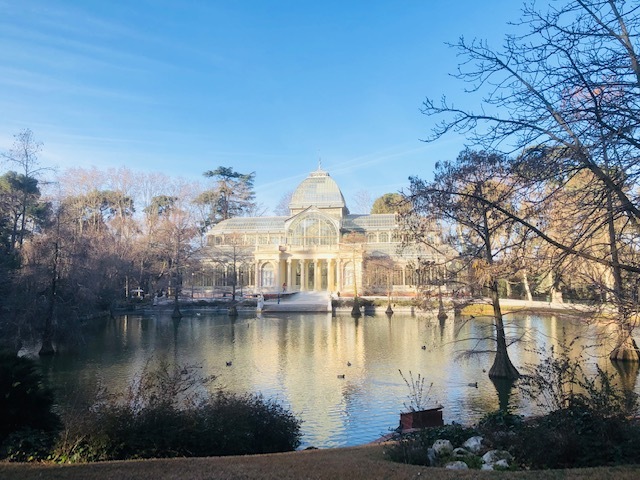 Although I live just minutes away from New York’s expansive Central Park and am use to gorgeous parks, I loved Buen Retiro because on the clear and sunny day I was visiting everything looked so magical. I loved the crystal palace located right in the center of the park and the giant pond where people were invited to partake in rowing through the peaceful water. A huge (and I mean huge) mass was going on when I visited the Cathedral so I wasn’t able to fully walk around….. but it was pretty cool listening briefly to a Spanish mass. Almudena is also located across the street from the Palace so it was a good place to kill some time before my entry time. I’ve heard that the Cathedral has a museum and a viewing area, but I wasn’t able to figure how to enter those areas because the mass pretty much limited movement inside. One of the things I love doing when touring European countries is visiting their palaces. The monarch history is just so interesting to me because in America we have never had kings and queens. There is something so glamorous about walking the same halls as royals and getting a glimpse of where they lived and worked. From Buckingham Palace in London to Versailles in Paris to Schonbrunn Palace in Vienna, I have throughly enjoyed visiting these palaces no matter the cost. So I knew I had to make a stop at Madrid’s beautiful palace! Fortunately, I booked my ticket in advance and had a scheduled time to enter so I avoided the long line at the ticket booth. I highly recommend doing this in order to save time- a prebooked ticket allowed me to fly right in, pick up my also prebooked audio guide, and begin touring the palace in under 10 minutes. Make sure to allocate around 2 hours for the palace tour! The audio guide lasts around an hour total, but if I include taking pictures, visiting the armory museum exhibit, and just standing around soaking all the gorgeously decorated rooms in the whole palace experience definitely lasts two hours. One thing I noticed was missing from the Madrid Palace was a garden. Both Schonbrunn and Versailles has beautifully created and maintained gardens behind their palaces, so I was slightly disappointed there was no garden to walk through. Hands down, the San Miguel market was my favorite part of Madrid. I enjoyed the market so much I went there twice! I love tapas, but since I was in Madrid by myself I wasn’t able to eat as much variety of tapas as I wished because I had no one else to share them with and the portions were too big for just one person. However, at Mercado San Miguel I was able to buy tapas by the piece. Meaning I was able to eat a vast variety of delicious bread based tapas, fried calamari and octopus, croquettes, quiche, empanadas, and dessert. 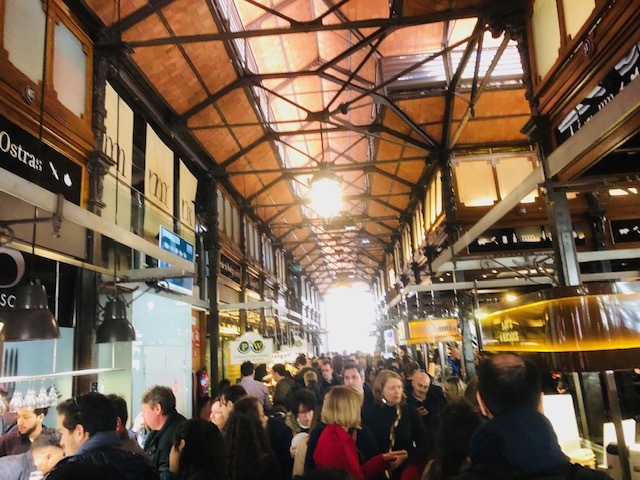 Mercado San Miguel is a food hall located near the Palace of Madrid that has numerous vendors inside selling all kinds of tapas. It is extremely crowded though so be prepared for the crush of people and watch out for your belongings! I knew before coming to Madrid that I would HAVE to check out the Spanish headquartered Zara there as well as my all time favorite store, Primark. Although we have both Primark and Zara in the U.S, it is really not the same. Primark (a London based retail store) is absolutely huge in Europe and sells everything a person could possibly dream of having at affordable prices. The Primark on Gran Via was 6 floors and filled to the brim with cute clothing and other products. A definite destination for those traveling on a budget, but still wanting to check out the shopping. Back home, Zara is one of my favorite brands, but I’ve always felt that the prices are slightly higher than I would sometimes be willing to pay. Since the store is based in Spain, I knew the prices would be much lower and I knew I wouldn’t be able to pass up the opportunity to pick up some outfits at the Gran Via Zara. I was looking to experience the cheap tapas culture of Spain so I decided to make a quick stop at 100 Monditas and try out their 1 Euro tapas. It turns out that they only had mini sandwich based tapas so while the variety and quality wasn’t too great, I loved having nachos and Spanish omelet sandwiches for 3 Euros only. This tapas bar is a chain and located everywhere in the city. If you’re craving a quick snack in between meals, then stopping by 100 Monditas is a fantastic idea. I wouldn’t suggest it for a full meal as the portions are simply not big enough. Flamenco dance is a type of dance that originated from Southern Spain and Flamenco performances are plentiful throughout Madrid. I had never seen a Flamenco dance performance before so I randomly bought a ticket from Teatro Flamenco, which claims to be the first Flamenco theater in the world, and sat down to watch a show on Saturday night. While it wasn’t what I was expecting at all (I thought the outfits would be more red! ), I really enjoyed watching the natural talents of the musicians and dancers and learning a little bit more about Spanish culture. Tickets were 16 Euros for students/youth and 25 Euros for adults so its pretty affordable. The show lasted about an hour so I was able to make it out in time for…. dessert! After my first night at San Gines, I desperately wanted to eat more chocolate and churros, but one of my main travel rules is to never repeat the same experience twice while traveling because there are just way too many things to experience (although I later broke this rule because I couldn’t resist going to Mercado San Miguel twice). After some quick Google searches, I discovered that Chocolateria Valor is also known for its churros, which are slightly different from San Gines’. There was also an option to have 4 different types of chocolates for dipping, which I immediately went for. It was interesting to try the clear sugary chocolate as well as the Madrid version of milk chocolate, dark chocolate, and drinking chocolate. Also, what is with the length of the churros in Madrid? I could get use to these giant churros! American churros need to definitely take note. How I Carried My Stuff- One of the main worries tourists, including myself, have when visiting European countries like Spain is pickpocketing. Pickpocketing is so common in Europe and the thieves are so smooth and skilled that most victims don’t even know something is missing until much later. This was one of my biggest concerns because the last thing I wanted was to be stranded in a foreign country alone without my phone, wallet, or passport. To avoid having to deal with this issue, I decided to use my Longchamp Le Pilage Large Nylon Shoulder Tote instead of my usual backpack (where weight is more evenly distributed and thus results in less shoulder strain). I suffered through one shoulder always feeling weighted down and managed to avoid getting anything stolen by having the zipper in front of me instead of behind and always keeping a hand on the zipper. The Longchamp tote is also spacious so there is plenty of room for a water bottle, camera, leather jacket, souvenirs among other belongings. Hope you enjoyed my Day 2 in Madrid adventures! What are you most interested in doing if you have the chance to visit the city?